If you've been following the experimentation by Bill Payne and me as we tackled building a signalling system for my Utopia Northern layout and the HO layout of the Nottawasaga Model Railroad Club (NMRC), you'll understand that at some point we had to make the trackside signals! I have some great-looking signals by Tomar Industries that work with the optical boards from LogicRail that I have installed. They operate beautifully and attrack a lot of attention, but it would have been too expensive for me to do all my signalling with them. I needed a less expensive solution. Signal construction is a little tricky. There's an article on the Internet by Peter Pemberton about building your own signals. It appeared in Model Railroader magazine. You can find it on the trains.com website. Peter used signal heads from Oregon Rail Supply. I tracked down some of their kits at a local hobby shop and bought a few extra 3-color signal heads. I test the LEDs before I start to make sure that I know which end is the cathode (-). These are usually marked by a metal band. I bought some more small 1.5 mm LEDs from Miniatronics and they seem to be marked the same way. It pays to be careful so that you don't get everything assembled and then find out you've wired in one of them backwards. I keep a DC power pack next to me with some alligator test clips and the appropriate dropping resistors: 1000 ohms for the red and yellow LEDs and 470 ohms for the green LED. The 1000 ohm resistor also works for the green. It doesn't matter which lead you use. I usually put the resistor in the negative line. I make it a point to retest after I solder wires to the LEDs before installing them in the heads. You need to tin the wires and the leads. I pass a file back and forth on the leads to make sure any oxidation is removed before I tin them. You want to work fast when soldering so as not to overheat the LED and burn it out. That's why I retest. 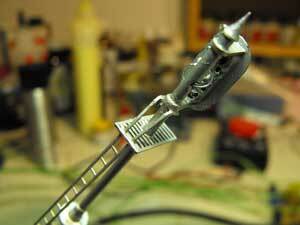 I use thin magnet wire and use an X-Acto knife to scrape the enamel coating off the ends. Some modelers burn it off with a lighter. Magnet wire, being very thin, makes it easier to slip the wires through the metal tube. Peter suggests soldering the common anode wire (+) to the mast. I prefer to thread it through the tube along with the other wires. Instead of a brass tube, some modelers have used a straw for the mast, like the smaller ones from fast food restaurants. Obviously, you can't solder to a straw. I have been making single 3-color heads so that only involves 4 wires. If I decide that my signal construction calls for a double head I may try his way. I doubt I could feed 8 wires through the mast tube. I never tried to do that. Peter's article says that Circuitron's wire is thin enough to fit six strands inside a 5/64" tube. I found it helps to deburr both ends of the tube so the wires don't snag. A pair of tweezers can be helpful in prodding the wires through. After I feed the wires through the mast and before I finish gluing the head assembly to the mast I add a dab of red Testor's enamel to the red lead, yellow enamel to the yellow wire, and I use a black marker to mark the common. As the magnet wire I'm using is green I don't bother identifying it. The reason for doing this is to make it easier to tell which wire is which after the signal is installed trackside. Make the leads long enough that they'll extend through the benchwork. It's usually necessary to add wires to the signals to get from trackside to wherever the logic boards are located. I use telephone wire for this and shrink wrap the soldered joint. It's easier to do this above the benchwork than from underneath. The other option is to make the leads long enough to reach a terminal strip beneath the benchwork. Here's the set-up I used. Using an X-Acto "third hand" makes it easier to solder the wires, complete the signal construction, and hold the completed signal for painting. I used Polly Scale Aluminum to paint the signals and I left the target face black. Because I had bought a few extra signal heads I decided to scratchbuild a couple more signals. I had some brass tubing that was approximately the same size. I didn't have a base, platform, or ladder. In my scrap box I found a piece of plastic fence material that was somewhat similar. After shaving off the tops of the pickets and cutting a hole in the center I had myself a platform. I also did not have any of the narrow ladder stock, but I did have some leftover brass ladder stock for cabooses. The result is a signal that's not as nice as the Oregon Signal Supply model, but I could use it at one of the more distant locations on the track to South Point that Bill and I decided to use as our signalling test track. Signal construction takes some effort. The effect of watching the signals change as the trains pass makes it all worthwhile. I encourage you to experiment, too. 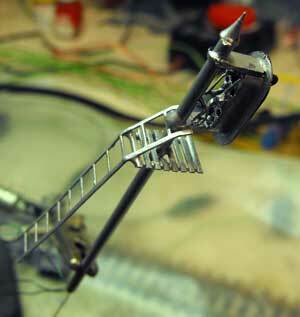 "I have been making my own HO signals as well. I found out that you can use the straw idea for the shade as you have mentioned [see my page about dwarf signals] and I also took a real small steel washer and cut the shade about the length of the small bi-polar LED. I glue the LED inside the straw where the LED lens is even with the bottom of the beveled hood/shade. I have been using the 3mm LEDS from Oregon Rail, the 5mm are too big in my opinion. You have to use a small diameter straw for the 3mm. I also found out that using a brass or copper washer works better because it joins the straw and the washer really well with super glue. It works best if you can get the 3 post type LED where the center post is ground and the 2 outer posts are red & green. Use 12vac with a diode in series with each color and connect the marked band end to ground which is different for each color. You then have a circuit that connects both colors at the same time to ground of the 12vac and you will get a pretty good yellow or amber color for making the signal a 3 color searchlight. Just make sure the resistor for the red does is not brighter than the green. You have to try different allowed values of resistors for the LED on the 12 vac. I used 220 or 330 ohm 1/2 watt resistor for the green & 560 ohm for the red. It shows that using ac at 12 volts you can use the 220 ohm ok for the green without burning it out. You have to experiment some to get the best colors for the yellow. Thanks Bill for letting me share your ideas with other modellers. We built new end modules on our travelling club layout in 2014. The modules needed signals because the divider backdrop did not allow visual identification of how the turnouts were lined up on the opposite side. Plus it's fun to watch the lights change and always intrigues the public at shows. John Houghton took on the project. I've added a section on the club's page on my website with a pdf about the signals and some photos of John's work with the cantilevered signals he built. John's N scale layout uses servo motors but the club layout uses Peco twin-coil switches so he had to do some fancy engineering. I plan to post his circuits when he has time to draw them with an explanation. Use the link in the Navigation Bar in the right column get to the NMR club page. Go from "signal-construction" to Making your own dwarf signals. Go from "signal-construction" to Making your own signal circuit boards. Go from "signal-construction" to DCC detectors. 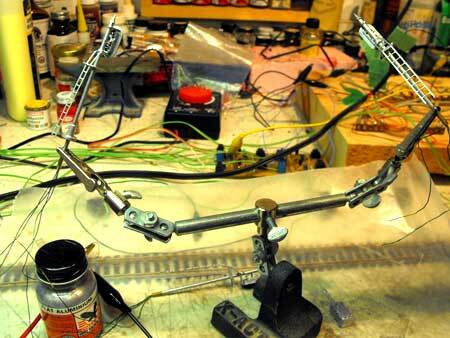 Go from "signal-construction" to Scratchbuilding a brass signal bridge. Return from "signal-construction" to my Home Page.